Portugal qualify for the semi-finals, despite failing to win any of their five matches in 90 minutes. Portugal coach Fernando Santos made two changes. The most important decision was handing Renato Sanches his first start of the competition, while Eliseu returned at left-back. Andre Gomes and Raphael Guerreiro dropped out. 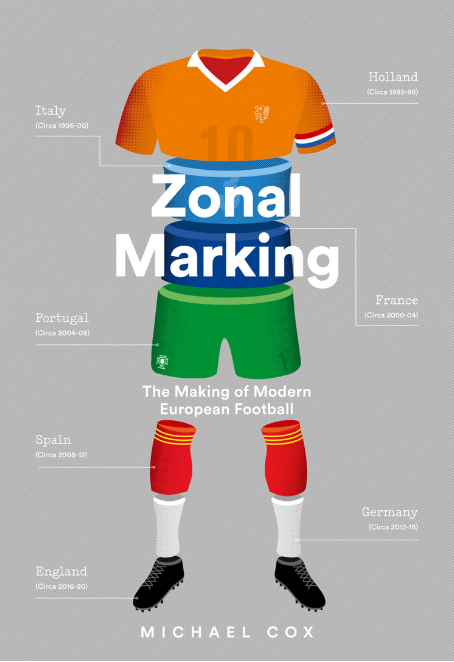 This game started off excellently – an early goal forced Portugal to come out and play more proactively than they had intended – but faded quite disastrously after half-time, in terms of intensity, technical quality and tactical interest. The first half, though, had been entertaining. The game had no time to settle down before Poland raced into a second-minute lead through Robert Lewandowski, who hit his first goal of the tournament with a lovely crisp finish from Kamil Grosicki’s left-wing pull-back. Grosicki had been found by a long diagonal pass from Lukasz Piszczek, and throughout the first half played high up against Cedric Soares, who slipped for the opener. This seemed a deliberate tactic, as Jakub Blaszczykowski played much narrower and deeper on the opposite side, providing a nice balance to Poland’s midfield. Beforehand, this game had seemed set for a patient tactical battle, and the first 25 minutes took a peculiar pattern as the teams adjusted to the game state. Santos had clearly instructed Portugal to drop off without possession, only trying to regain possession inside their own half – which has been a common approach at this tournament. But that approach was no longer viable because Portugal were now behind and chasing the game. For long spells, therefore, Poland simply knocked the ball around between their defenders, almost teasing Portugal up the pitch to press. This pattern was particularly obvious throughout the first half as Portugal tried to get back into the game, but in truth continued into the second period too, as Poland had no real approach for bypassing Portgual’s block. Eventually, Portugal would shuffle forward to close down, but usually only their attacking players pressed, with the defence still holding a relatively deep line. Santos was seen encouraging his players up the pitch as a unit, but they became disjointed because the defenders didn’t push up the pitch sufficiently. This created space in midfield, and Poland would then hit longer passes into the front two, bypassing Portgual’s midfield and attempting to get Lewandowski and Arek Milik to combine. It’s an approach Italy have used successfully in this competition. When Portugal did press, holding midfielder Grzegorz Krychowiak often dropped between the centre-backs with the full-backs pushing forward, turning Poland into more of a 3-3-3-1 formation. This type of flexibility has been sadly rare at this tournament, and while Poland didn’t play particularly impressively in this shape, it meant Krychowiak found time on the ball, and added some much-needed technical quality to a Polish defence that appears somewhat rudimentary. 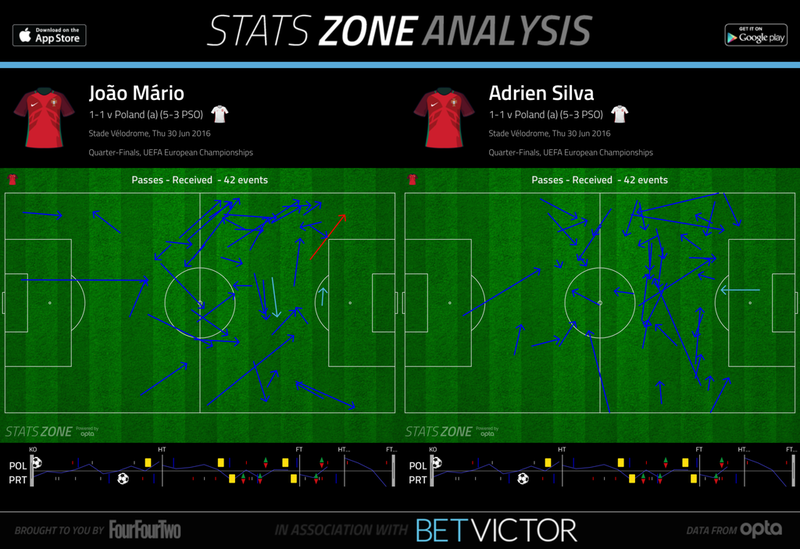 Allowing the full-backs forward also worked well against a Portugal midfield that instinctively wanted to remain very narrow, and forced Joao Mario and Adrien Silva (or whoever was defending the wide areas for Portugal) out of their favoured positions. Indeed, the most interesting feature of the game was simply the Portuguese system in isolation. In a tournament extremely low on tactical interest, Santos has created the most peculiar system by far, although it’s debatable whether it’s actually very effective. It’s remarkable that a country famed for their tendency to produce quality wingers has ended up playing without wingers whatsoever, instead choosing to deploy Nani and Ronaldo as centre-forwards, with the players on the outside of the midfield quartet starting narrow, and drifting wherever they like. The use of Nani and Ronaldo upfront is clearly a response to Portugal’s long-standing lack of a quality centre-forward, Santos deciding there’s simply no point deploying a striker whatsoever if none are up to the job. Nani has taken to the role impressively, drifting around in right-sided positions and making clever runs, including one for Portugal’s equaliser here, which dragged both Kryzystof Maczynski and Michal Pazdan out of position to create space for Renato Sanches to storm into, having played a one-two with Nani. 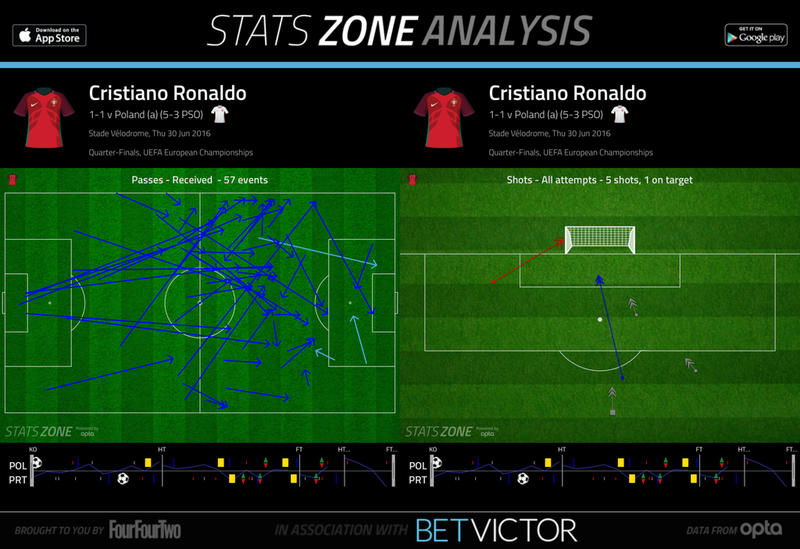 Ronaldo stays higher up the pitch in an inside-left position. He generally dislikes playing this role, even if he’s in his favoured zone, because opposition centre-backs can dedicate themselves to stopping Ronaldo’s runs. 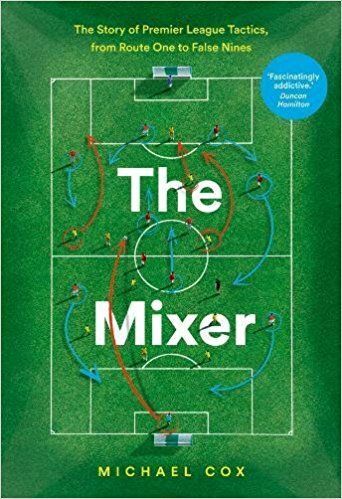 He prefers playing from the left of a three-man attack, with a centre-forward making decoy runs – and while there have been flashes of brilliance in this competition, Portugal have often struggled to get the ball to their best player. He received the ball frequently in his favoured inside-left positions, but never had space to shoot from there. The midfield system is extremely peculiar. William Carvalho sits solidly in front of the defence, with the other three midfielders given huge freedom to rotate their positions. Here, the outstanding Sanches was usually in the central role and was given the responsibility of shutting down Krychowiak when he dropped between the centre-backs, as well as driving forward regularly in possession. 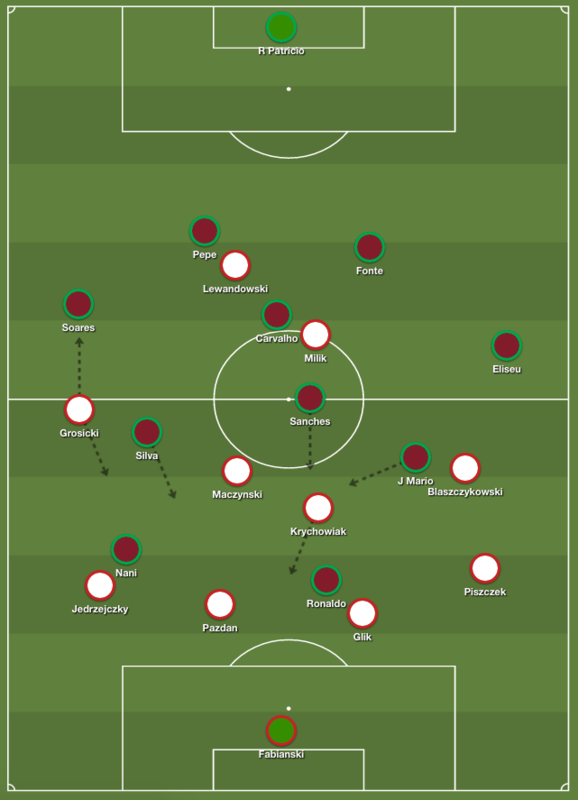 It seemed a strange approach against a Polish side so good at protecting central zones, and Portugal might have been better had they used the drifts of these players to create overloads in wide positions. Out wide, both Portuguese full-backs are good going forward, but were often left to fend for themselves with no-one to work passing combinations with. They crossed regularly, but generally from hopeful positions. 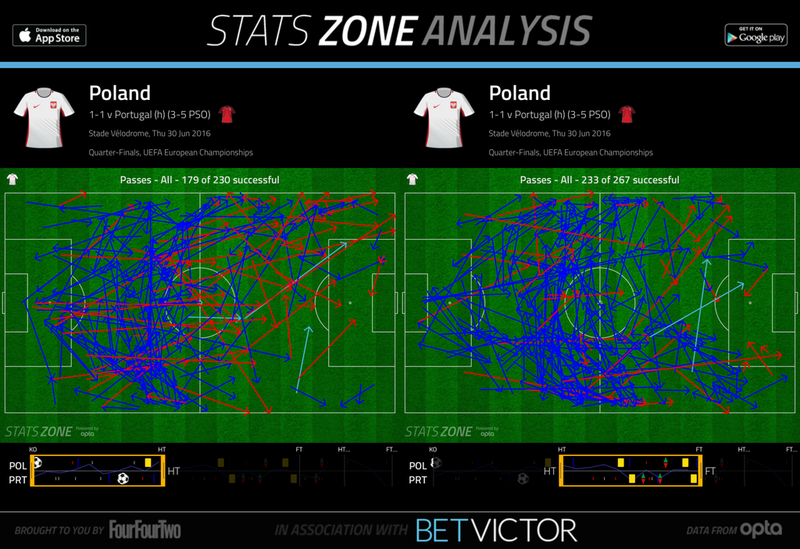 Portugal dominated possession, but there was no clear plan to create goalscoring chances. Santos presumably wants to create something similar to the Spain side that won Euro 2008, but that side had tremendous cohesion between Xavi Hernandez, Andres Iniesta and David Silva, while the former two players often cross sides to combine in wide areas. Here, Portgual simply played square balls in central positions that didn’t shift Poland’s midfielders out of position. The movement off-the-ball didn’t open up angles for penetrative passes, and there was no link between midfield and attack, which forced Nani and Ronaldo to move into non-threatening positions to collect possession. Aside from Sanches’ driving runs, Portugal simply didn’t look threatening, and a 1-1 draw seemed likely from the hour-mark. The second hour of the game was extremely uneventful. A disappointing game. On paper this could have been interesting: Portugal’s fluidity against Poland’s structure, but neither side offered any cohesion between attacking players, which has sadly been a major theme throughout this competition overall. The only interesting aspect was the way Portugal were forced to abandon their approach without the ball to adapt to going behind, which took rather too long but was eventually successful in getting Portugal back into the game. Practically R. Sanches’ goal ruined the game, as knowing the type of manager Santos is, it was obvious that Portugal’s forwardness was only in search of the equalizer. So I was hoping that this equalizer would come as late as possible, so we would see a good game until then. Unfortunately it came in the 38th, and after it boredom took over. Sorry for this – have fixed.